This article is about Event of Ghadir. For other uses, see Ghadir (disambiguation). The Path of Hajjat al-Wida' where the Prophet (s) and his companions returned from Mecca to Medina. To see the details click on the image. The Prophet (s) moved from Medina to Mecca on Dhu l-Qa'da 24 or 25, 10/February 632 accompanied by thousands of people (some even mentioned this number more up to 120 thousand people). This hajj of the Prophet (s) was also called Hajjat al-Wida' (farewell Hajj), Hajjat al-Islam, and Hajjat al-Balagh. In that month, Imam Ali (a) was in Yemen for preaching Islam and when he was informed about the Prophet's (s) hajj, he (a) also moved towards Mecca together with some people and joined the Prophet (s) before rituals began. When rituals of hajj finished, the Prophet (s) left Mecca for Medina together with other Muslims. Muslims arrived at Ghadir Khum on Thursday Dhu l-Hijja 18, 10/March 19, 632, but before the people of Syria, Egypt and Iraq leave for their own countries, Jabra'il (Gabriel) revealed al-Tabligh Verse to the Prophet (s) when God ordered the Prophet (s) to introduce Ali (a) as his vicegerent and guardian to people. After revelation of the verse, the Prophet (s) ordered the caravan to stop and ordered those who have passed Ghadir Khum return and wait until those who had not yet arrived there join them. 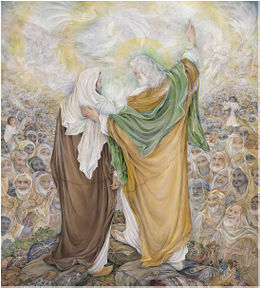 After performing noon prayer, the Prophet (s) made a speech which became famous as Ghadir Sermon. In that speech, the Prophet (s) said, "Praise belongs only to God and we ask Him for help and we believe in Him and take refuge to Him from the evil of our selves and ugliness of our actions… God, the Merciful and All-Knower informed me that I will be called (to Him) soon and I will submit to (His call)… I will come to the pond of Kawthar before you do and you come to me beside it; so beware about how you treat Thiqlayn (two great things); al-Thiql al-Akbar, the greater one is the Book of God and the other is my household." Then, the Prophet (s) raised 'Ali's (a) hand so that people could see him and then said, "O people! Am I not more deserved to your guardianship than you yourselves?" and people answered, "yes, O Prophet (s)!" Then, the Prophet (s) said, "God is my guardian and I am the guardian of the believers and I am more deserved for your guardianship than you for yourselves. Therefore, anyone whose guardian is me, then 'Ali (a) is his guardian." The Prophet (s) repeated this sentence three times and said, "O God! Befriend and be the guardian of whom befriends 'Ali (a) and considers me his guardian and be the enemy of those who is his enemy. Help anyone who helps him and leave anyone who abandons him." Then, he (s) addressed people and said, "Those who are here ought to deliver this message to those who are absent." Then, people congratulated Imam Ali (a) including Abu Bakr and 'Umar who repeatedly said, "Happy for you O son of Abu Talib (a)! You are my Wali (guardian) and the Wali of every believing man and woman." The Prophet (s) ordered that a tent was erected for Ali (a) and ordered people to go to him group by group and salute him as the Commander of the Faithful (a); and all people, even the wives of the Prophet (s) and other women followed this order." There is disagreement regarding the number of audience in the event of Ghadir Khum. They have been mentioned 10 thousand, 12 thousand, 17 thousand or 70 thousand people. Regarding the capacity of the area in Ghadir Khum, the population of Medina in 10/632 and also the number of people who went to hajj in farewell Hajj, the least number reported which is 10 thousand people is more credible. The narration of Ghadir has been mentioned in both Shi'a and Sunni sources and some parts of the Prophet's (s) speech are more frequently quoted such as "anyone whose guardian is me, then Ali (a) is his guardian." The Sahaba and many of the Followers have reported the event. Ahl al-Bayt (a), i.e. Imam Ali (a), Lady Fatima (a), Imam al-Hasan (a) and Imam al-Husayn (a) Then a number of 110 Companions of the Prophet (s) can be seen including, 'Umar b. al-Khattab, 'Uthman b. 'Affan, Aisha bt. Abi Bakr, Salman al-Farsi, Abu Dhar al-Ghifari, Zubayr b. 'Awam, Jabir b. 'Abd Allah al-Ansari, 'Abbas b. 'Abd al-Muttalib, Abu Hurayra, etc. who were all present in Ghadir Khum and narrated the event directly. Also, the event has been reported by 83 of the Followers including, Asbagh b. Nubata and 'Umar b. 'Abd al-Aziz, the Umayyad caliph. Then, it also can be seen reported by 360 Sunni scholars of 2nd to 4th/8th to 10th century including, the leader of Shafi'ites, Hanbalites, Ahmad b. Shu'ayb al-Nasa'i, Ibn al-Maghazili, Ahmad b. 'Abd Allah and Ahmad b. 'Abd Rabbih. Also, many Shi'a hadith scholars have narrated the hadith of Ghadir including al-Shaykh al-Kulayni, al-Shaykh al-Saduq, al-Shaykh al-Mufid, al-Sharif al-Murtada, etc. Many scholars consider hadith of Ghadir as Hasan and some considers it Sahih. Also, all Shi'a hadith scholars and some great Sunni scholars consider this hadith as Mutawatir [frequently narrated]. Shi'a and Sunni exegetes believe that some verses in the Qur'an are about the event of Ghadir and have been revealed to the Prophet (s) in Hajjat al-Wida'. Verse 3 of Qur'an 5 which is known as the al-Ikmal Verse and says, "Today, I have perfected your religion for you, and I have completed My blessing upon you, and I have approved Islam as your religion." Verse 67 of the same sura which is called the al-Tabligh Verse and says, "O Apostle! Communicate that which has been sent down to you from your Lord, and if you do not, you will not have communicated His message, and Allah shall protect you from the people." Verses 1 and 2 of Qur'an 70 which reads, "An asker asked for a punishment bound to befall (1) —which none can avert from the faithless" referring to the event that after the Prophet (s) announced the guardianship of Ali (a), a man whose name was Nu'man b. Harith al-Fihri came to the Prophet (s) and complained that, "You ordered us to acknowledge Tawhid, your mission, performing jihad, hajj, fasting, prayer and giving zakat and we accepted. But, you were not pleased with this much until you appointed this young man as our Wali. Is this appointment your own decision or from God?!" When the Prophet (s) answered him that it has been the order of God, the man asked God disdainfully that if this order is from God, a stone fells on his head from the sky. Then, a stone fell from the sky on his head and he dropped dead and this verse was then revealed. Imam Ali (a) said, "O Muslims, Muhajir and the Ansar! Did not you hear that the Prophet (s) said this and that on the Day of Ghadir Khum?" Everyone said, "yes!" Lady Fatima (a) said, "It is as if you do not know what the Prophet (s) said on the day of Ghadit Khum! I swear to God, the Prophet (s) appointed and upheld the position of Wilaya and Imamate for Ali (a) to avoid your greed to take it." Imam al-Hasan (a) said, "Muslims saw the Prophet (s) and heard him when he (s) took my father's hand on the Day of Ghadir, when he (s) addressed them, 'anyone whose guardian is me, then Ali (a) is his guardian.'" Imam al-Husayn (a) said, "The Prophet (s) raised Ali (a) through all good manners and when strengthened Ali's (a) soul, appointed him for Imamate and on the Day of Ghadir said, 'anyone whose guardian is me, then Ali (a) is his guardian.'" Imam al-Rida (a) said, "Day of Ghadir is more famous among the dwellers of skies than the people of the earth… if people knew the value of this day, the angels would undoubtedly shake hands with them 10 times a day." Muslims, especially Shi'a have always regarded the Day of Ghadir as one of the greatest Eids and this day is known to them as Eid al-Ghadir. It has been esteemed so much that making allegiance with Musta'li b. Mustansar (an Egyptian ruler) was held on the Eid Ghadir Khum 487/1094. Also, it is narrated by Sunni scholars that anyone who fasts 18th of Dhu al-Hijjah, (which is the day of Eid Ghadir Khum) God will reward him equal to the reward of 6 months of fasting. The eve of Ghadir Khum is also celebrated among Muslims. The Prophet (s) said, "Day of Ghadir Khum is the greatest Eid of my people and that is the day when God perfected religion, and completed His blessing upon my people, and approved Islam as their religion." Also, Imam al-Sadiq (a) said, "Day of Ghadir Khum is a great Eid of God. God has not chosen a prophet unless He has regarded that day an Eid and has glorified it; and the name of this day is the "Day of Promise" in the skies and the "Day of Covenant" and Public Attendance on the earth." Abu Nu'aym. n.d. Hilyat al-awliya. Beirut: Dar al-Kitab al-'Arabi. Abu Rayhan Biruni. n.d. Athar al-baghiya. Tehran: Ibn Sina. Ahmad Hanbal al-Shaybani. n.d. Musnad Ahmad b. Hanbal. Beirut: Dar Ihya' al-Turath al-'Arabi. Al-Amini. n.d. Al-Ghadir. Beirut: Dar al-Kitab al-'Arabi. Al-'Ayyashi. n.d. Kitab al-tafsir Trans. by Sayyid Hashim Rasuli Mahallati. Tehran: Chapkhane 'Ilmiyya. Al-Bayhaqi. n.d. Manaqib al-Shafi'i Ed. Sayyid Ahmad Saqar. Cairo: Maktabat Dar al-Turath. Al-Hakim al-Haskani. n.d. Shawahid al-tanzil Ed. Muhammad Baqir Mahmudi. Tehran: Irshad Islami Ministery. Al-Halabi. n.d. Al-Sira al-Halabiyya. Beirut: Dar al-Ma'rifa. Al-Hurr al-'Amili. n.d. Wasa'il al-shi'a. Qom: Mu'assisa Al al-Bayt. Al-Jazri al-Shafi'i. n.d. Asna l-matalib Ed. Muhammad Hadi Amini. Isfahan: Maktabat Imam Amir al-Mu'minin. Al-Juwaini. n.d. Fara'id al-simatayn Ed. Muhammad Baqir Mahmudi. Beirut: Mu'assisa Mahmudi. Al-Khatib al-Baghdadi. n.d. Tarikh Baghdad Ed. Mustafa 'Abd al-Qadir. Beirut: Dar al-Kutub al-Ilmiyya. Al-Mufid. n.d. Al-Irshad. Qom: Mu'assisa Al al-Bayt (a). Muhibb al-Tabari. n.d. Al-Riyad al-nadira. Beirut: Dar al-Nadwa. Mutahhari, Murtada. 1364 sh. Imamat wa rahbari. Qom: Intisharat Sadra. al-Muttaqi al-Hindi. n.d. Kanz al-'ummal. Beirut: Mu'assisa al-Risala. Al-Nasa'i. n.d. Al-Sunan al-kubra Ed. 'Abd al-Ghaffar Sulayman. Beirut: Dar al-Kutub al-'Ilmiyya. Qumi, Shaykh 'Abbas. n.d. Muntaha l-a'mal. Isfahan: Naqsh-i Nigin. Al-Qurtubi. 1364 sh. Al-Jami' li ahkam al-Qur'an. Tehran: Nasir Khusru. Reyshahri, Muhammad. n.d. Muwsu'at al-Imam 'Ali b. 'Abi Talib. Qom: Dar al-Hadith. Al-Saduq. n.d. Al-Amali Ed. Mu'assisa Bi'that. Qom: Mu'assisa Bi'that. —. n.d. Al-Khisal Ed. 'Ali Akbar Ghaffari. Qom: Jami'a Mudarrisin. Al-Shu'ayri. n.d. Jami' al-akhbar. Qom: Intisharat Radi. Tabataba'i, Sayyid Muhammad Husayn. n.d. Al-Mizan fi tafsir al-Qur'an. Qom: Jami'a Mudarrisin. Al-Tabrasi. n.d. Al-Ihtijaj. Mashhad: Nashr Murtada. —. n.d. Majma' al-bayan. Beirut: Mu'assisa al-A'lami li l-Matbu'at. Al-Tha'alibi. n.d. Thimar al-qulub Ed. Ibrahim Salih. Damascus: Dar al-Basha'ir. Al-Tha'labi. 1422 AH. 'Al-Kashf wa l-bayan 'an tafsir al-Qur'an . Beirut: Dar ihya' al-Turath al-'Arabi. al-Tirmidhi. n.d. Sunan al-Tirmidhi. Beirut: Dar al-Ma'rifa. Al-Tusi. n.d. Al-Tibyan Ed. Ahmad Habib Qasir. Maktab al-A'lam al-Islami. —. n.d. Tahdhib al-ahkam Ed. Sayyid Husayn Musawi Khursan. Tehran: Dar al-Kutub al-Islamiyya. —. n.d. Talkhis al-shafi Ed. Sayyid Husayn Bahr al-'Ulum. Tehran: Dar al-Kutub al-Islamiyya. Al-Wahidi al-Nisaburi, Abu l-Hasan 'Ali. n.d. Asbab Nuzul al-ayat. Cairo: Mu'assisa al-Halabi. Ibn 'Abd Rabbih. n.d. Al-'Iqd al-farid. Beirut: Dar Maktabat al-Hilal. Ibn al-Maghazili. n.d. Manaqib 'Ali b. 'Abi Talib. Tehran: Maktaba Islamiyya. Ibn Athir. n.d. Usd al-ghaba Ed. Muhammad Ibrahim Banna. Cairo: Dar al-Sha'b. Ibn Kathir. n.d. 'Al-Bidaya wa al-nihaya Ed. 'Ali Shiri. Beirut: Dar Ihya' al-Turath. Ibn Khalkan. n.d. Wafayat al-a'yan Ed. Ihsan 'Abbas. Lebanon: Dar al-Thiqafa. Ibn 'Uqda al-Kufi. n.d. Kitab al-wilaya Ed. 'Abd al-Razzaq Hirz al-Din. Qom: Dalil-i Ma. This page was last edited on 9 November 2018, at 07:20.